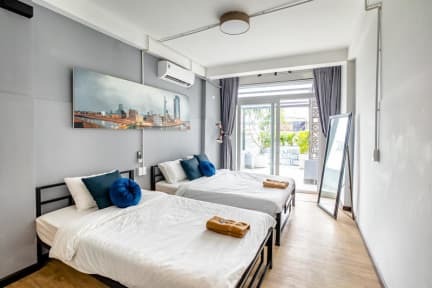 Flipside Hostels is Kiwi owned and operated with over 14 years combined experience in hospitality and travel in Vietnam and South East Asia. As Kiwi's we love adventure and sure know how to explore and have a good time. Customers can Check-in at reception 24 hours a day with 24-hour security and a helpful travel desk open from 6am-10pm. Come speak to our friendly staff for advice. Great hostel with a sister location just 150m down the road. Couldn't have asked for a better experience on the busy walking street! The manager is there from morning until late at night and was always willing to help with booking tours, buses, where the local hot spots are or where to get a cold beer. Dorm rooms are secure and the privacy curtains on each bed are a nice touch. Great rooftop bar with drink specials. Overall would recommend to anyone looking for a cheap, nice hostel. 10/10. Great location and comfortable beds. Nice common area in lobby. The pool is everything you need to escape the heat of the city. Social hostel but not a party hostel as there aren't any pub crawls organised. Very nice staff. A good hostel but on a very crazy party street - otherwise no complaints about the rooms or the hostel. It's a nice hostel if you like to party, not so much for the quiet souls. And you are not allowed to flush toilet paper, which means you have to throw it in a bin, thats why the bathrooms are sometimes smelly. Got a private room and it stank. No windows in the room to let it air out after a shower and i think someone might have pissed the bed before me. Location was good if you want to be in the thick of it all. But a private room was not worth the price. Find another hotel on the street for cheaper and same quality. If not better. Staff were great though.